I’ve owed you a proper makeup tutorial for a long time now, and when this beautiful package from Sugarpill arrived this week, I had no excuses left. My friend Amy just launched this new make up line, and reviews have been popping up like happy spring berries all over the ‘wub. I thought about waiting a little while until the furor simmered down a bit, but after rummaging through the box and being mesmerized by the colors and variety, I decided to go for it, man. Just look at this stuff! Of course, adorable packaging doesn’t necessarily for a good product make, so I was really looking forward to giving Sugarpill a go. Last night I was meeting an out-of-town friend at The Edison – my favorite place in the world. The atmosphere there is dark and full of magic, especially on a less-crowded and relatively yuppie-free Wednesday night, so I got a little dolled up for the occasion. Red eyeshadow has been my favorite alternative to black since high school, so when I saw Love, the deepest, perfect crimson pressed shadow, in my Sugarpill package, I did not hesitate. With Love set aside, I gathered the rest of my ammunition and went into battle. 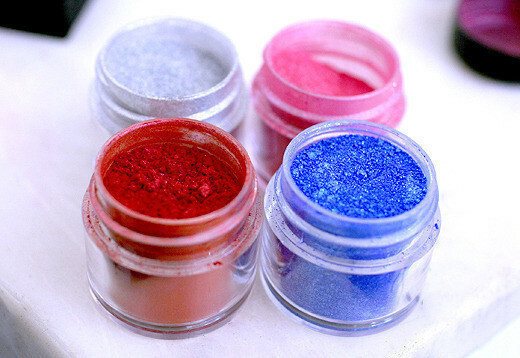 Until now, I have been a little apprehensive about loose powder eyeshadows, but those days are done. I used these both wet and dry, and was happy with the results. Didn’t have any mixing medium on hand, so I used a drop of water for the product around my eyes, and a little bit of body shimmer gel to mix the blue with for my brows. The breakdown below may look a little complicated at first, but I assure you, this doesn’t have to take much longer than your usual routine if you prepare everything you’ll use ahead of time. Loaded a cheap-o sponge applicator with Love, and distributed evenly it all over my lids, blending out and up. I also used a bit under the eyes. With Decora on the other side of the applicator, I continued to blend Love out, all around the eye. Used a dry angle brush to fill in the inner ends of my eyebrows with Royal Sugar, then, for a sharper look, mixed the shadow with a little body shimmer gel, and used the same brush to paint the outer ends. Dabbed Tiara with a small wet brush on the inner corners of my eyes, then blended it out with more Tiara, this time dry. I can’t sing enough praises to this stuff, it’s so pretty. With a small, wet blending brush applied a line of Asylum, under my eyes only. Used matte white from the palette to highlight the brow. Did my usual cat eye with Prestige liquid liner and added a bit under the eye, at the outer edges and along the water line. My mascara of choice has been L’Oreal Voluminous Mascara in Carbon Black for years and years. It’s amazing, buildable, and inexpensive. With a blush brush, dabbed and blended a bit of Tiara to highlight my cheekbones. With the same brush, used Decora as blush. Dusted my face with Prestige’s Skin Loving Minerals powder foundation. It’s half the price of Bare Escentuals and more matte, so I decided to try it. Haven’t researched it properly just yet, so I can’t recommend it officially, but I do really like it. And finished it all off with lip gloss from Smashbox. This is just a fraction of the looks to come, but so far I am 100% into Sugarpill. I can’t wait to play with yellow and gold and green and, and and…! More tutorials to come as time allows. ur make up looks great but ur glasses are super fantastic! The make up really pops with your hair. How did you get your hair that color? I love this look and your glasses are cute! OwO I've been looking for make up that'll go great with cosplaying (especially my chara since she has blue hair) and now thanks to you, I've got it! Holy crap thats alot of Sugarpill cosmetics. >.> How much did all of that cost? It looks like a great brand.